The manufacturing workshop of The Francis Frith Collection is located a few miles outside the historic city of Salisbury, and we are very fond of this lovely place – so we thought we’d celebrate our ‘home town’ with this selection of lovely vintage views in our photographic archive, to show you what a delightful place it is. different site. The perambulator in the foreground now seems decidedly old-fashioned. Driving on the left of the road seems here to have been given a flexible interpretation! 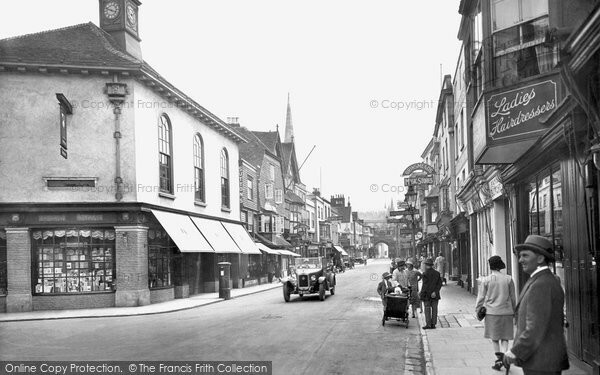 Photo: Salisbury, High Street 1928. This is a view of one of the city’s best narrow medieval streets, Minster Street, lined with tall, overhanging shops and houses. Almost all the buildings date from the 15th century: note the overhanging upper storeys and the timber framing. The famous Haunch of Venison Inn on the left of this photo is virtually untouched both externally and internally. This atmospheric hostelry is probably the oldest and smallest pub in Salisbury. In 1911 a severed, mummified human hand was discovered in a wall of the building during renovation work. It was clutching some old playing cards and was reputed to be the hand of a man in the 18th century who was caught cheating whilst playing cards with a butcher from nearby Butcher Row, whereupon the angry butcher chopped off his hand with his knife. The grisly relic was displayed in a glass case in the pub until 2010, when it was stolen. However, a replica of the hand can still be seen there – and the handless card player’s ghost is said to haunt the building! 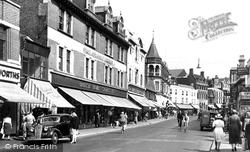 Photo: Salisbury, Minster Street c.1950. This view of Salisbury’s High Street in 1906 shows a busy and bustling parade of shops and services. Edwards garage sign on the right is interesting. In the 1890s Miss Edwards turned her bicycle shop into a modern motor garage – the first in Salisbury. The Old George Hotel, dating from 1401, can be seen on the left, along with handcarts, bicycles and horse-drawn carriages. 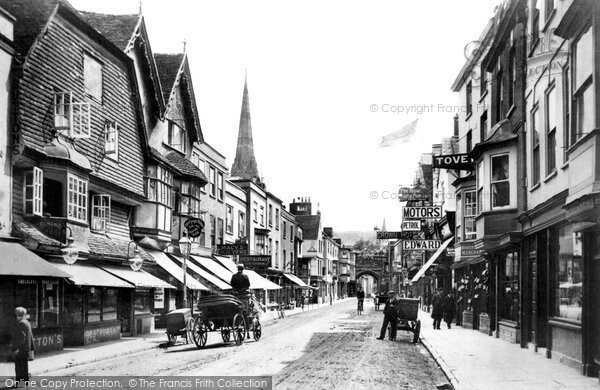 Photo: Salisbury, High Street 1906. 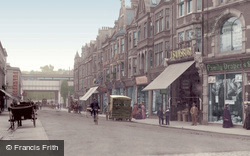 The same view taken thirteen years after the 1906 High Street photo above, when the motor car and bicycle have replaced the horse and handcart. Note that everyone in the photograph is wearing a hat. Since the earlier photograph the road surface has been improved by ‘metalling’, and many of the old gas lamps have disappeared. 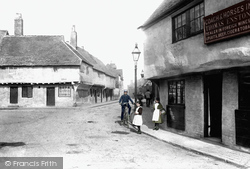 Reminders of the produce sold in various parts of the city in medieval times are found in a number of Salisbury’s old street names such as Fish Row, Ox Row, Salt Lane and Oatmeal Row, as well as the beautiful hexagonal Poultry Cross that stands in the city centre at the junction of Butcher Row and Minster Street. 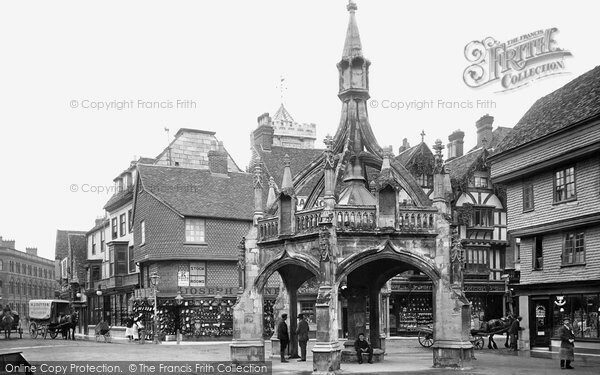 This famous landmark of the city dates from the 15th century and is the only survivor of Salisbury’s four medieval market crosses. It marked the area that was reserved for the selling of poultry and vegetables. 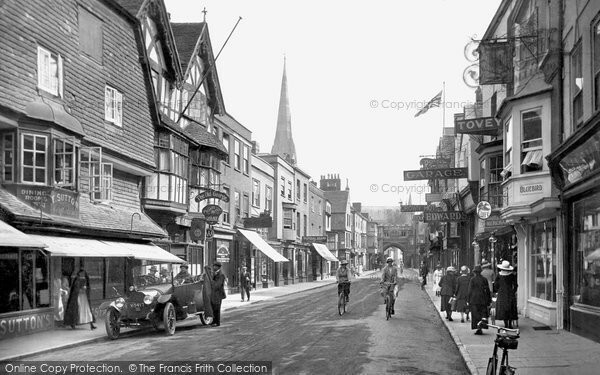 Photo: Salisbury, Poultry Cross And Silver Street 1906. Peeping over the rooftops in the background of the photograph of the Poultry Cross is the tower of the church of St Thomas of Canterbury. Inside the church is a remarkable and complete medieval Doom painting, dating from the 1470s. This amazing painting was whitewashed over in the 1590s and not discovered until 1881, when it was restored. Christ sits in judgement at the centre, with the blessed on His right hand and the damned to His left; the Devil waits below – and bishops are among those entering the mouth of hell! 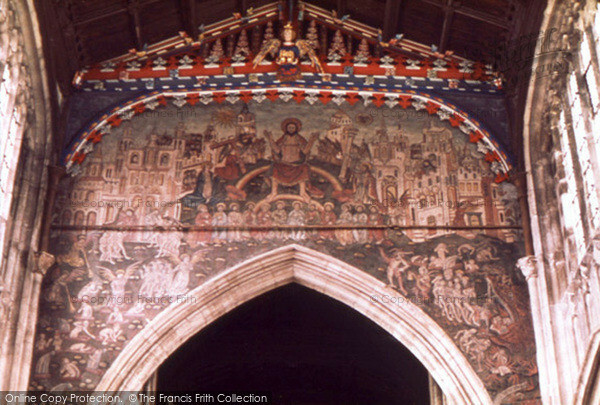 Photo: Salisbury, St Thomas's Church, Doom Painting c.1990. 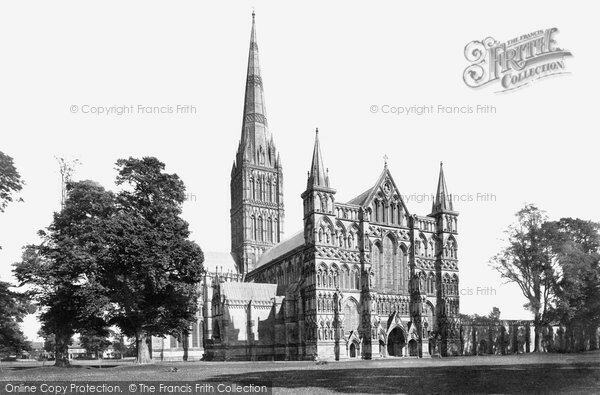 Photo: Salisbury, The Cathedral, North West 1887. Salisbury is Wiltshire’s only city, centred around its glorious medieval cathedral. The main body of the cathedral was completed between 1220 and 1260, in one Gothic style, Early English, which gives it a unique symmetry and unity of architectural design. It was the vision of Bishop Richard Poore, who is represented by one of the 69 statues on the west front, the second from the left in the bottom row. He is shown holding a model of the cathedral, but without the soaring spire that now adorns it – that was not part of the original design and was added later, completed by 1334; at 404ft (123m) high it is the tallest spire in England. There is a tradition that the cathedral has 365 windows to match the number of days and 8,760 pillars to match the number of hours in a year. 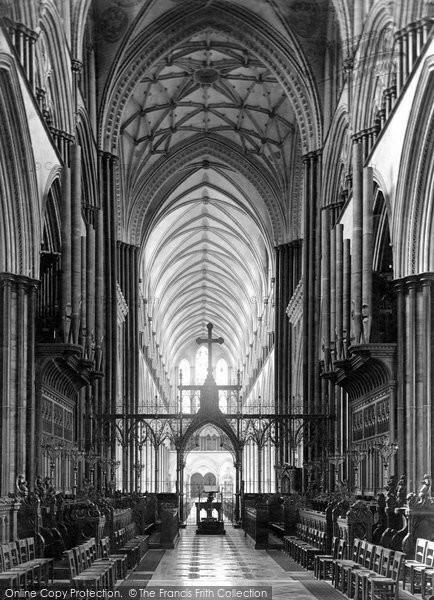 Photo: Salisbury, The Cathedral, Choir West 1887. 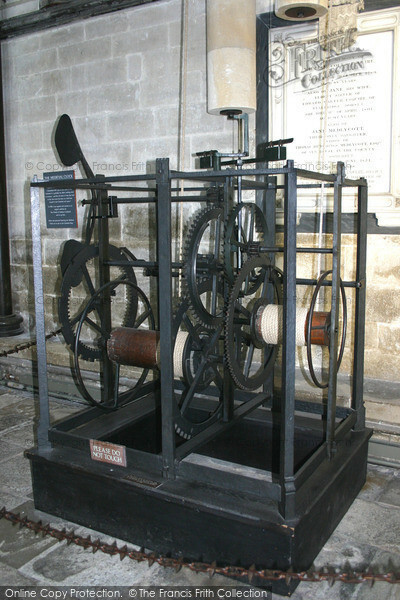 In the north nave aisle inside Salisbury Cathedral is the oldest working mechanical clock in Europe, which dates from 1386, although it is quite primitive – it has no face, and only strikes the hours. Another treasure of the cathedral is one of the four original copies of the Magna Carta, which is displayed in the Chapter House. Photo: Salisbury, The Oldest Clock 2004. Built in 1331, St Ann’s Gate links the Cathedral Close with St John’s Street and Exeter Street. The chapel above the gate, built into the Close wall, was used for concerts. The plaque to the right prohibits livestock and discourages motor cars from entering the Close. Note the gas street lighting and the dress of the boys in the foreground. 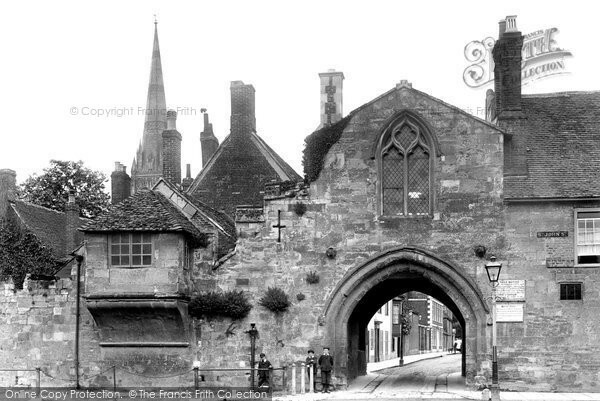 Photo: Salisbury, St Ann's Gate 1906.
boundary between city and church. Looking through the gate, the Porters Lodge and Matrons' College can be seen. 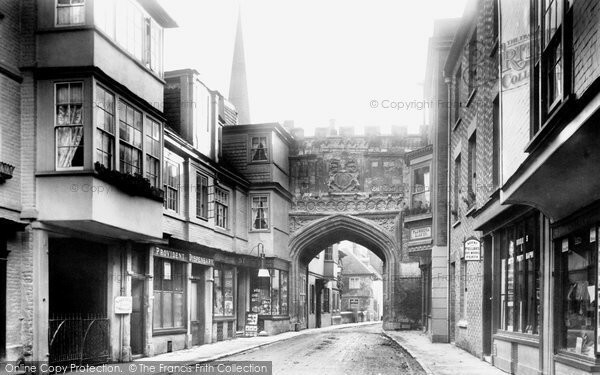 Photo: Salisbury, High Street Gate 1894. The King’s House in Salisbury Cathedral Close was a teacher training college when this view was taken in 1928 and now houses the Salisbury and South Wiltshire Museum, but on 2nd November 1483 it was where King Richard III was lodging when he had Henry Stafford, 2nd Duke of Buckingham beheaded in Salisbury’s Market Square for treason – afterwards, Buckingham’s head was brought there for King Richard to see. 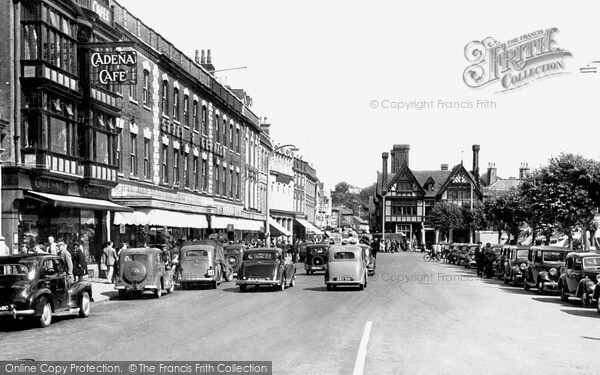 Before his execution the Duke was imprisoned in the Blue Boar Inn, which stood on the site occupied by the Style and Gerrish’s department store in Blue Boar Row the 1950s view below, which is now occupied by the Debenhams department store – and his ghost is said to haunt the store to this day. One of the treasures of the museum is the Salisbury Giant. He stands over 12ft (3.66m) tall and is a unique survival of life in the medieval city, when he was paraded in the streets by the Salisbury Guild of Tailors as a pageant figure during their annual celebration on the eve of the feast of St John (Midsummer’s Day). In later times the Giant was also paraded through the city on occasions of public celebration, such as coronations or jubilees. He passed to the museum in 1873 and was still taken out for public celebrations until 1979 when he was ‘retired’. He now forms the centrepiece of the Salisbury gallery of the museum, accompanied by his companion, the Hob-Nob, a mischievous hobby-horse character who cavorted in front in the procession clearing the way for the Giant. 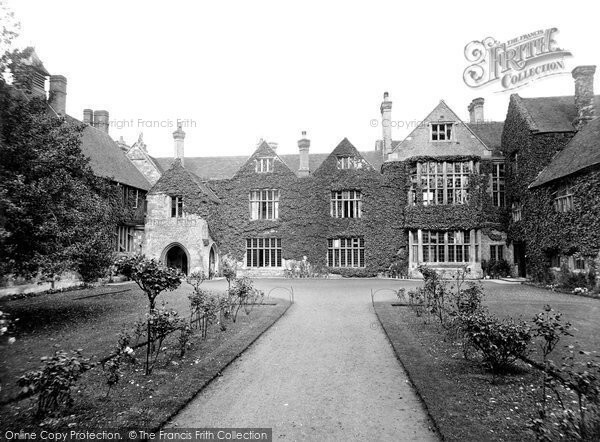 Photo: Salisbury, King's House Teacher Training College 1928. 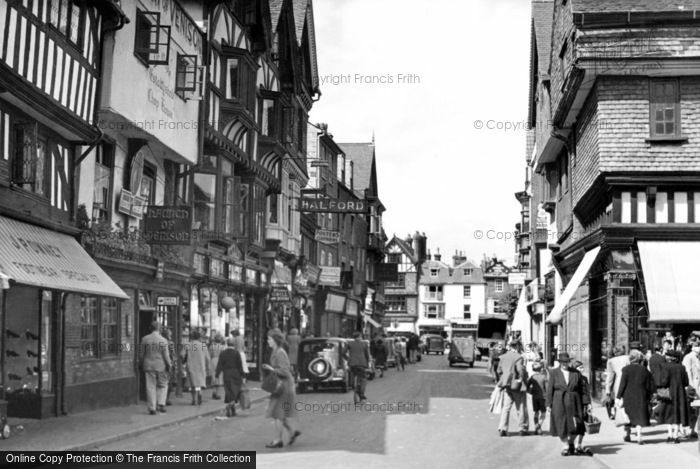 Photo: Salisbury, Blue Boar Row c.1950. This post has the following tags: Nostalgia,Places.